Before bowing out of office in June, President Benigno Aquino III can still generate more than P1 billion in private funds for improvement of water services to 20 million Filipinos with just a stroke of a pen. "All the President needs to do is sign the Congress-approved bill granting tax breaks to local water utilities and he can free up to P1.005 billion for the improvement of water service delivery in some parts of the country," said Senate President Pro Tempore Ralph Recto. Senate Bill No. 2518, which seeks to condone certain taxes of community-owned local water districts (LWDs), was ratified by the Senate and the House of Representatives last December but remain unsigned at the Office of the President. "Clean water for Filipinos. This is one legacy that will leave an imprint for generations to come," added Recto, who is the principal author of the bill. Recto explained that the bill condoning unpaid taxes of LWDs effectively removes the administrative bottlenecks in making this claim and will allow them to use the fund exclusively for improvement of water service. In 2010, Congress passed what would become Republic Act 10026, which grants income tax exemptions to local water districts, in effect extending to them the same privilege government-run utilities like the Metropolitan Waterworks and Sewerage System (MWSS) had already been enjoying. In addition, RA 10026 condoned the tax obligations of LWDs from August 1996 up to the time it took effect in March 2010. It, however, imposed the condition that water districts who wish to apply for condonation must prove its financial incapacity to the Bureau of Internal Revenue (BIR). They were also required to submit to Congress a program for "internal reforms." Despite the submission by LWDs of these documents, the BIR did not issue the corresponding revenue regulations, rendering the law inoperable, Recto said. What the tax agency instead issued was Revenue Memorandum Circular 68-2012, which enumerated the procedure, and the documentary requirements for condonation. 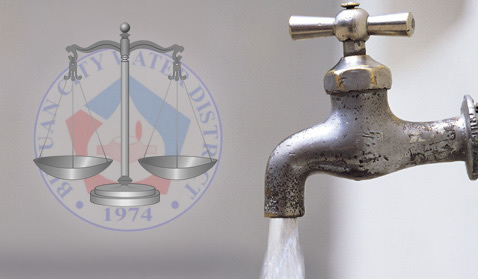 Despite these, 161 water districts "diligently applied for condonation," with 78, whose unpaid taxes amounted to P842 million, able to comply with the documentary requirements. Recto said that under RA 10026, the condoned taxes can only be spent by water districts for the improvement of their services like the purchase of equipment. "Let us look at the numbers. The 78 LWDs had a combined liability of P842 million. And the total receivables from all LWDs is P1.005 billion," the senator pointed out. "In the end, the people will benefit because taxes foregone are mandated to be plowed back to them," Recto said. Recto cited as an example the Cagayan de Oro water district, which applied for P20 million in tax savings to resuscitate dead wells. In Visayas, the senator added, the Metro Cebu Water District plowed back P67 million in capex for better distribution lines. "This is the kind of dividends we want to see - not through checks to stockholders but better service to customers. There are two kinds of water companies - those whose profits trickle up to their owners and those whose income trickle down to their customers," Recto said. When signed into law, according to Recto, the measure "will help the 514 local water districts that work round-the-clock so that 20 million Filipinos will have clean water to drink."